Sonoma State University sports update, March 15-22. Women's water polo wins two of three in Indiana, men's golf finishes third and women's track and field sets 9 personal records. 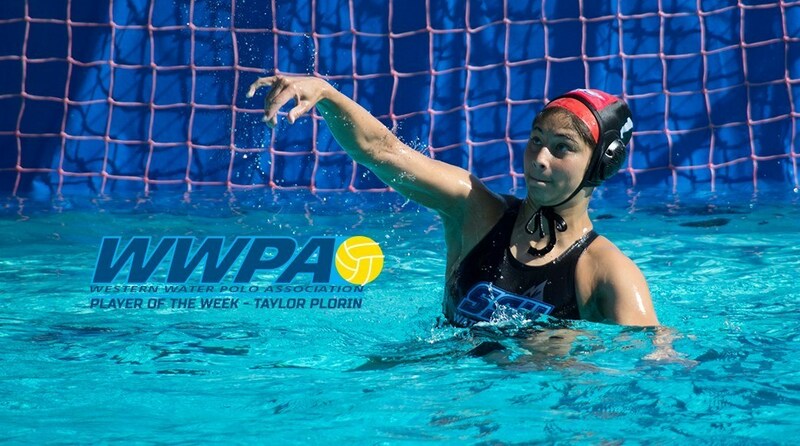 Freshman goalie Taylor Plorin has been named the KAP7 Western Water Polo Association Player of the Week for the week of March 14-20, it was announced March 22. Plorin, a native of Vista, Calif., made 37 saves in three games this past weekend. Nicole Groat scored six goals and Taylor Plorin made 26 saves in two games as the Sonoma State women's water polo team blew out Gannon 17-6 before holding on to a narrow 9-8 victory over Mercyhurst on March 19 to wrap up play at the Fluid Five, hosted by Indiana University. On March 18 Carleigh Robinson scored twice and Taylor Plorin made 11 saves, but the Sonoma State women's water polo team lost 12-4 to No. 16 Indiana to open the Fluid Five, hosted by the NCAA Division I Hoosiers this weekend in Bloomington, Ind. After a slow start in the first two rounds, the No. 25 Sonoma State men's golf team jumped eight places from a tie for 11th place at the end of the second round to a third place finish at this week's NDNU Argonaut Invitational at Poppy Ridge Golf Club on March 15 in Livermore. Nine different Seawolves recorded personal records to cap an impressive day for the Sonoma State women's track and field team at the Hornet Invitational in Sacramento on March 19. The Seawolves had a particularly rewarding day in the middle distances where three student-athletes recorded their top times in both the 800 meters and 1500 meters. The Sonoma State baseball team lit up the scoreboard against the Pioneers on March 19, as they scored 19 runs across two games and hit three home runs on their way to a sweep at Seawolf Diamond and a split of the weekend series. The Seawolves began a home-and-home weekend series with the Cal State East Bay Pioneers with a doubleheader at Pioneer Field on March 18 but came up short, as the Pioneers pulled away in the opener and a late home run propelled them to a come-from-behind victory to complete the sweep. Amanda Llerena fired a five-hit shutout and Alee Balanon went 2 for 3 with a double and an RBI in the Sonoma State softball team 5-0 victory in game one on March 19 before Cal State San Marcos responded with a 1-0 victory themselves. The two teams split a doubleheader at the Seawolf Softball Field in Rohnert Park. The Seawolves (14-11) are No. 4 in CCAA standings with an 11-8 mark against conference opponents. After a convincing 6-2 win in the opener, the Sonoma State softball team scored two runs in the bottom of the seventh inning to walk off with a 3-2 victory in game two over visiting Cal State San Marcos on March 18 at the Seawolf Softball Field. The Sonoma State softball team rallied for three runs in the bottom of the seventh inning to tie the game at 5-5, but it wasn't until the top of the 14th inning that Cal State Monterey Bay could break the tie and eventually capture the 6-5 victory after a four hour, 19 minute marathon in the opener of the March 16 doubleheader at the Seawolf Softball Field in Rohnert Park. Game two of the doubleheader was halted after five complete innings with the two teams tied at 1-1. The game will have to be continued and finished at a later date and time, which has yet to be determined. After the No. 26 Sonoma State women's tennis team shutout Notre Dame de Namur 9-0, the Seawolves nearly pulled an upset of NCAA Division I Idaho, falling by a narrow score of 5-4 to cap the March 17 doubleheader at the SSU Tennis Courts. The Seawolves moved to 10-3 this season and will host No. 33 Cal State L.A. on Sunday at 11 am. Point Loma jumped out to an early lead, going up 2-1 in doubles and edging out Sonoma State 5-4 on March 15. The Sea Lions' Regina von Koch captured the match-clinching point on court 2 with a three-set victory, 3-6, 6-1 and 6-3 over Kearney. After a busy weekend on the road, the Sonoma State men's tennis team returned to their home court on March 16, only to see the University of Idaho roll to an 8-1 victory. The NCAA Division I Vandals took all three doubles matches and five of the six singles contests, with Sonoma's only win coming from Kevin To at the No. 6 spot. Sonoma State University sports update, Feb. 23 to March 1. Men's basketball loses in overtime, women's tennis remains undefeated, women's basketball splits two and women's golf finishes third in Texas.